MSc Sport Business and Leadership students recently had the exciting opportunity to visit Bisham Abbey National Sports Centre. Major highlights of the visit include learning about the leadership philosophies of CEO Sally Munday and Women’s Assistant Coach Karen Brown, fresh off their gold medal performance at the Rio 2016 Summer Olympics. The full-day visit was a huge success in bridging leadership theory with actual practice utilised in the sport setting. Student, John, wrote about the amazing opportunity given to our Sport Business and Leadership students. In November 2016 twenty students from the Leadership Models and Practices course took a one-day visit to GB Hockey at Bisham Abbey, Buckinghamshire. Sitting in the Warwick Room with views over the Abbey lawns we had presentations from two key leaders – the GB Hockey CEO, Sally Munday, and the Assistant Head Coach to the senior women’s team, Karen Brown. Our first speaker, Sally, has been working in hockey since 1998 and, having previously been England Hockey Development Director, she is now England Hockey’s Chief Executive. Sally spoke to us with passion and enthusiasm about her leadership of the organisation, and was positive about how peoples’ backgrounds shape their approach to leadership. She discussed how her values such as integrity and clarity guide her day-to-day work, and in this context she challenged us to think about how we demonstrate our leadership capabilities. Sally is well respected is the world of sport, and was a great addition to Liz Nicholls, the UK Sport CEO, who we’d seen just a couple of weeks previously. Both are similar leaders in British sport and they described similar values that guide how they work. It was interesting, however, to analyse how those values were put into practice in their active leadership styles. Our second speaker, Karen, is Britain’s most capped women’s hockey player and won Olympic bronze in 1992. Karen began coaching in 2000 and discussed a leadership style that focuses on the culture of the organisation as much as her direction of it. I’d suggest she sees her leadership style as that of a conductor, completely knowing the strengths and weaknesses of her team to be able to get the best out of them. Whilst her planning and preparation are fundamental to good leadership, she requires her team also to be able to think for themselves. The example Karen used to illustrate her leadership was the women’s 2016 Olympic Hockey final just a couple of months earlier, where GB had won the tournament after a penalty shootout in the final. It was incredible of her to play us a video of the final from just before the final whistle through to the end of the shootout, and talk through action-by-action what happened on and off the pitch. The insight she provided us with was fascinating and positively incomparable to any normal leadership discussion, and really placed the theory we have been learning in our lectures into practice. It was clear that GB Hockey won because of both the team’s planning and specifically Karen’s understanding of how each player contributes to the wider team. 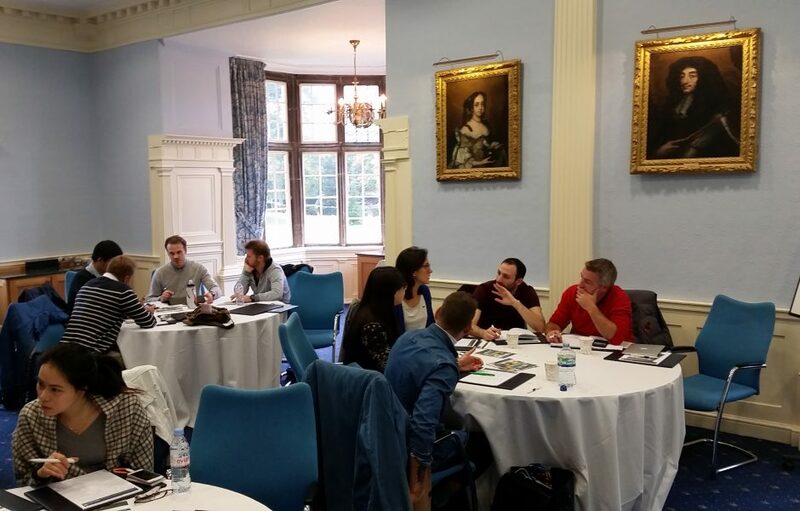 We’ve been fortunate on this course to visit a number of sporting institutions and to hear from a range of national and international sports leaders – the Leadership Models and Practices module is without doubt the highlight of the Sports Business course. Loughborough University London would like to thank John Grant for his contribution to our blog. We would also like to extend our gratitude to GB Hockey at Bisham Abbey, the students definitely enjoyed their informational and inspiring visit. To find out more about our Sport Business and Leadership course take a look at our website.